Page 8 is the new front page: You usually read about politicians claiming to get a live bullet in the post or a threat from a rival party, but Dr Boo says here that he's received a death threat from a comrade. The Johor DAP chief will reveal all at a press conference soon. ah, so nice of you. no Guan Eng bashing today? Careful of your paycheck bro. I've always thought the suicide in limbo stinks. 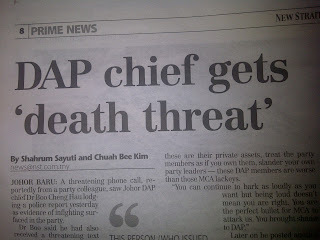 DAP will soon issue gag order to all the members on the issue. So much about transparency and freedom of speech in DAP. Pakatan will issue a press statement to blame UMNO for this. If that fails to convince PAS members, they will say that MIC has bought Dr. Boo over. And every fool will believe it. CHI8, if you dont like Rocky's writings.. you dont have to be here. Muka tak malu ka? Eh, since when it has become UMNO's business ? So nice of you to be so concerned. Can depend on the police to investigate ah ? Did the person who got threatened report to police ? You did not pray for the well-being of a boy abused by your blogger friends. 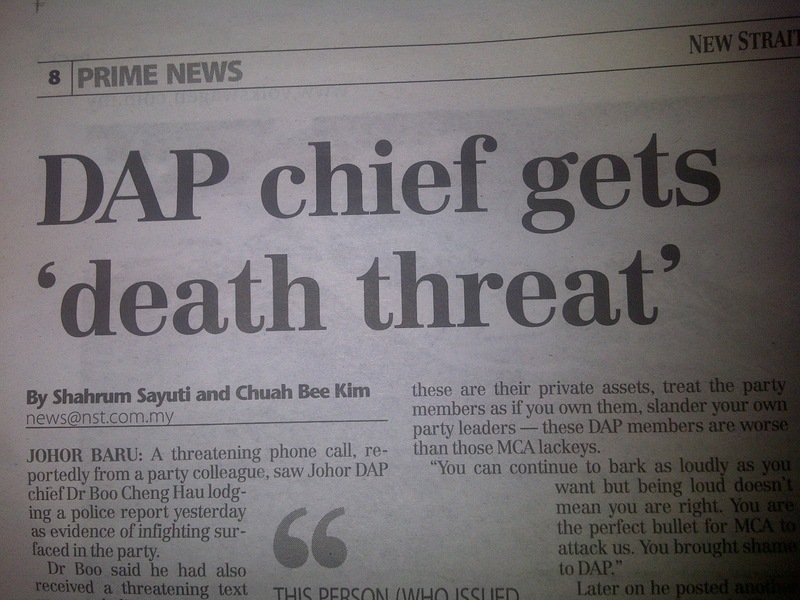 Why now to a DAP chief? As I said before: You are a nut. Rocky concerns about the saftey of DAp ?